Technotape P.P. 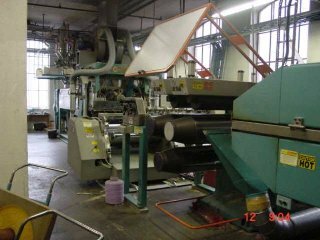 Extrusion Line - Manufacturer: Sima/Italy, 1996 Year. Description: Technotape P.P. Extrusion Line - Manufacturer: Sima/Italy, 1996 Year. Extruder 100mm Diameter. Die 1.0mm. Includes Chill roller, tape cutter, Godet No. 1 has (3) rollers. 5.0mm long hot air stablilization oven, Godet No. 2 has (3) rollers, Godet No. 3 has (4) rollers. The Fibrillator is integrated on the 3rd Godet roll. The take up winder has 10 positions. Speed: 300 meters/min. Production: Upto 260 Kgs/hr. Tenacity: 5-7 grams.